Houses reflect the traditional culture of Bayburt and have managed to survive up until today. Made of wood and famous Bayburt stone, known to maintain room temperature in summer and in winter, the unique Bayburt houses are witnessing extensive restoration. 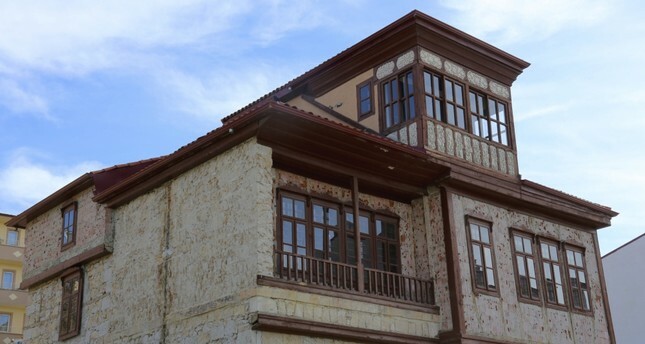 Officially registered as examples of civil architecture in recent studies conducted by the Bayburt Governorate and the Bayburt Provincial Directorate of Culture and Tourism, three of the 44 attention-grabbing houses featuring wooden ornaments and kirmans are under restoration. Speaking to Anadolu Agency (AA), Bayburt Governor Ali Hamza Pehlivan said: "Bayburt, which is an historical settlement in Anatolia, has castles, places of worship and houses registered as examples of civil architecture. We initiated a project to restore the civil architecture to its original magnificence. The houses, which were officially registered as examples of civil architecture after a recent survey, reflect the traditional culture of the city and [have] managed to survive until today." In addition to the publicly funded restoration process, there are responsibilities that must be undertaken by the landlords. "As the buildings belong to our citizens, they must cooperate with us. First, we contact them and inform the landlords about the regulation [the order to support immovable structures] in the Code of Protection of Cultural and Natural Properties [Law no. 1863]. According to the regulation, landlords are supported both in the process of the project and in the process of application [to some extent]," Pehlivan said. sion, which belongs to the Directorate of Culture and Tourism. It will be transformed into an ethnography museum. There is another Bayburt house under restoration with the support of Bayburt Municipality and the Culture and Tourism Ministry. Hence, we have three mansions under restoration for now. One of them is about to be completed, while the other two will be ready next year." Pehlivan advised landlords of the registered buildings that they can get their houses restored by getting support from the relevant authorities. Reiterating that the restoration of the buildings can be conducted by handing the recovery process over to the municipality, the Provincial Special Administration or the Provincial Directorate of Culture and Tourism, Pehlivan said: "We continue to inform the landlords of the issue. These artifacts reflect a very old culture. You can observe both the living spaces and traditions of past generations. What's more, they mesmerize visitors with their ceilings, floor furnaces, common use areas and divans." The governor underlined that protecting these houses means protecting history and added, "These buildings, which also have tourism potential, will enrich Bayburt's standing and the cultural richness of the city after restoration." "When the restoration is over, such structures will attract more visitors. Our guests will have the chance to witness cultural traditions more closely by visiting these mansions while enjoying natural beauty, Bayburt Castle and the mosques in the city." Pehlivan expressed his gratitude to the Culture and Tourism Ministry, the Erzurum Provincial Directorate of Surveying and Monuments, the Bayburt Provincial Directorate of Culture and Tourism and the directorate of the Bayburt Museum in addition to the landlords who cooperated with the governorate.